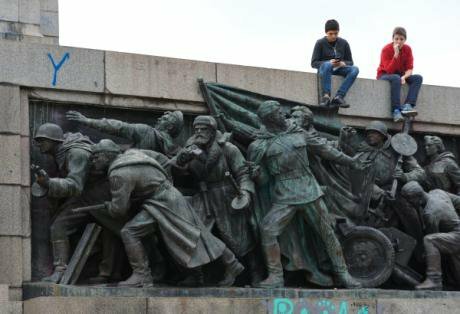 Monument to Soviet soldiers, Sofia. (c) Alexey Vitvitsky / RIA Novosti. All rights reserved.Two weeks ago, retired air force general Rumen Radev was elected president in Bulgaria. Certain Russian commentators such as obscurantist Aleksandr Dugin proclaimed Radev’s landslide win a breakthrough triumph for Russia — the general had been typed beforehand as a “pro-Russian” candidate. In response, western media went into a near-hysterical tailspin, producing sensationalist headlines implying Bulgaria had “fallen” to the Kremlin. In the era of “post-truth politics”, Bulgaria’s presidential election appeared foremost a victory for the Kremlin. “Post-truth”, recently named word of the year by Oxford Dictionaries, has been associated with the instrumental use of disinformation or the “weaponisation of information” in what has been termed Russia’s new propaganda war. Moscow uses propaganda outlets such as RT and Sputniknews as well as a multitude of other often dubious internet outlets, together with an “army of trolls”, to spread subterfuge, and divide and sway public opinion in order to destabilise the west and undermine the European Union. But propaganda can, in fact, serve as a distraction to conceal Russia’s pursuit of its interests with or without the complicity of local actors and even elites. Most of the time, Moscow does not even need to steer the propaganda game — western media outlets and commentators often do the groundwork upon which the Kremlin can simply prey. Bulgaria and its recent presidential elections are an illustrative example. Here, the media hysteria masks an uncomfortable reality: a story of state capture that has been in progress for years. After the election triumph of alleged Russian favourite Donald Trump stunned the world, analysts have been looking at the presidential elections in Moldova and Bulgaria where “pro-Russian” candidates' victories would top off a very satisfying week for Vladimir Putin. Radev’s win thus provoked headlines such as “Pro-Russia Candidate Appears Likely to Win Bulgarian Presidency”, “Russia-friendly Radev wins Bulgarian presidency”, “Pro-Russia candidate wins Bulgaria's Presidential Run-off”, “Pro-Russia Rumen Radev wins Bulgarian presidency” around the world. The message was clear: Bulgaria had elected in favour of Russia and, by implication, against Europe and the west. Bulgaria is known for its deep historical and cultural ties with Russia, as well as its Soviet-era loyalty to Moscow. So most press coverage failed to elaborate on the complexities and intrigues of Bulgaria’s domestic politics. Instead, the focus was on the seemingly increasing geopolitical confrontation between Putin and the west, in which Russia had its eye on Bulgaria. More sober analyses point to the fact that Radev is not more “pro-Russian” than the country's prime minister Boyko Borisov, who tendered his government's resignation in the wake of “his” electoral defeat — Radev’s opponent had been Borisov’s hand-picked candidate. Borisov did, however, succeed in projecting Radev as the pro-Russian “Manchurian candidate”, a depiction the western media happily picked up on — with Bulgarian media in turn relaying western headlines with even more urgency. As I have written about previously, brandishing one’s opponent as “pro-Russian” to ensure western backing has become a trait of Balkan politicians to outfox their opponents. Radev’s image as “pro-Russian” was nonetheless strengthened by the contrast of his campaign rhetoric with that of Bulgaria’s outgoing president Rossen Plevneliev, one of the few vocal critics of Moscow in the region. Bulgaria has featured from time to time in Russia media and propaganda outlets over the past years. As a rule this has been for the consumption of the Russian audience with tabloid media appearing to be more active in this regard. Nevertheless, the main source of pro-Russian propaganda lies not in Russia, but in Bulgaria itself. March 2011: meeting of ATAKA at Alexander Nevsky Square in Sofia. CC BY-SA 4.0 Wikimedia Commons / Ivan. Some rights reserved.Various political parties such as the Bulgarian Socialist Party or the far-right ATAKA and groups such as the National Movement of Russophiles foster pro-Russian sentiments or Soviet-era nostalgia. More significantly, there exists a homegrown pro-Russian current in various media outlets such as A-specto, Duma, Rusia Dnes, Ruski Dnevnik and many more which regularly agitate and spread disinformation. In addition, certain Russian “dignitaries” have featured provocatively in Bulgarian media. In February, Vladimir Zhirinovsky, stated that Russia would buy all Bulgaria's vegetables and provide it with cheap gas if the country would leave NATO. But Zhirinovsky, a notoriously raving vulgar lunatic, merely fulfils the loyal function of the court jester in Russia\s Duma, the rubber-stamp parliament in Putin’s system of “managed democracy”. In September, another Russian MP, Pyotr Tolstoy, stated on Bulgarian National Television that Russia “will just buy out” Bulgaria wholesale since Russians already owned “half the coastline”. The comment sent shockwaves through the country despite the fact that Russia's economy, battered by sanctions and dwindling oil prices, is in no state to “buy out” anything — let alone a prime piece of real estate in the Balkans like the whole of Bulgaria. What Bulgarian media failed to point out was that Duma MPs like Zhirinovsky and Tolstoy hardly make policy in Russia. The Kremlin and, more precisely, Putin’s inner circle does. A core problem of the Bulgarian media reporting on Russia has been its tendency towards sensationalism instead of in-depth analysis — not a surprise in a country where oligarchic interests control much of the media landscape, which is subjected to increasing tabloidisation. Even the few independent quality media outlets in Bulgaria tend to be disoriented when it comes to Russia. This became clear in the immediate aftermath of the presidential election. The Bulgarian daily Dnevnik ran an article about Dugin reacting to Radev’s victory and deliriously rejoicing on Facebook that “Sofia is ours”. Dugin was presented as one of Putin's key ideologues propagating the philosophy of Eurasianism and who coincidentally has been targeted by American sanctions in relation to the Ukraine crisis. Dnevnik’s article went viral on social media among rightfully concerned Bulgarians. Yet, the article got its basic facts wrong. The reason Dugin has been targeted by western sanctions is because members of his Eurasian Youth Union are fighting in the war in Donbas. But Dugin himself, for all intents and purposes, has never met Putin, is not part of his inner circle, and has no formal ties to the Kremlin. To describe him as “Putin's ideologue” is a distortion of reality, a “post-truth”. Dugin is on the political fringe and wields about as much influence on Russian policy as Mickey Mouse on US policy. But the media spin has nevertheless served to aggrandise and even mythologise him. Other outlets then started reporting on an interview that “Kremlin political analyst” Leonid Reshetnikov, gave on Russian television. In it, Reshetnikov claimed that the envisioned early parliamentary elections will be a referendum on Bulgaria’s NATO membership. The interview again went viral provoking outrage on social media. While the media cited Reshetnikov as the head of the Russian Institute of Strategic Studies, a Kremlin-affiliated think tank, they did not mention that he had been retired prior to the Bulgarian election. 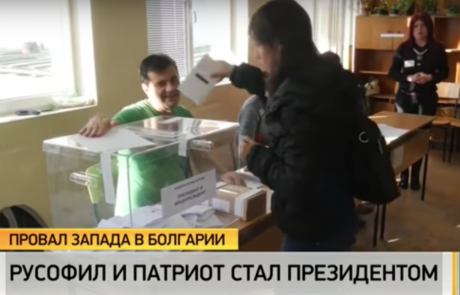 "West's failure in Bulgaria: Russophile and patriot becomes president": TsarGrad TV reports on Radev's win. Source: YouTube.Neither was it noted that the channel in question, TsarGrad TV, was not a “mainstream” Kremlin-controlled outlet, but a fringe setup owned by the media oligarch Konstantin Malofeev, an Orthodox Russian nationalist monarchist who sponsors Dugin. To assume that Dugin, Reshetnikov, and TsarGrad TV are representative of the Kremlin’s policies is a fallacy. The official reactions from Moscow to Radev's election have been less vocal and strikingly cautious. There is hope for “constructive relations” — a rather vague statement — but Kremlin spokesman Dmitry Peskov even stated that Moscow does not regard Radev as “pro-Russian”. It would indeed be ridiculous for any Kremlin official to publicly state that Radev, a US-educated former NATO general, would pull Bulgaria out of NATO. Putin is not a nationalist like Dugin. The latter merely serves as a useful idiot spawning cheap “agitprop”. This function is often strengthened by panic-ridden analyses by western commentators and media who pick up on these quotes. They do so in search of an ideological frame through which to present the Kremlin's actions. More so, western commentators often substitute a Kremlin-instigated plot for what are otherwise domestic developments. This phenomenon goes well beyond Bulgaria. In fact, the more the western media are complicit in this, the more room for maneuver they potentially give to the Kremlin. 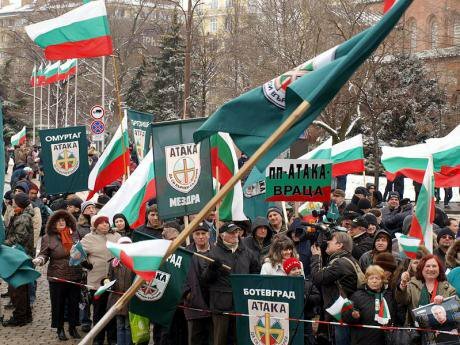 For there certainly is Russian influence in Bulgaria, and it is no small matter. Recently, two in-depth reports, one authored by Bulgarian political analyst Dimitar Bechev and another The Kremlin Playbook by the Center for Strategic and International Studies in Washington and the Center for the Study of Democracy in Sofia, have examined the degree of penetration of Russian interests (which are mainly economic) in Bulgaria. In these reports a story of literal “state capture” is revealed. Russia holds an economic footprint of about one quarter of Bulgaria’s GDP, ranging from the energy sector — oil, gas, nuclear power — to the finance, telecommunications, real estate and media sectors. More than three quarters of Bulgaria’s imports from Russia consist of hydrocarbons. Gazprom dominates Bulgaria’s gas sector, while Lukoil, which owns the country’s only refinery, channels investments through its trading companies in the Netherlands, Austria or Switzerland. Russian individuals and entities hold stakes in more than 4,600 companies in Bulgaria. To maintain this position, Russia relies on a complex and murky network of contacts and intermediaries from oligarchs and businessmen to officials and politicians. Through this network, Russia can influence policy in Bulgaria in its favour. The existence of this network precedes Radev’s election, and the mechanism through which Russia can exert influence on Bulgarian politics has been in place for years. This network does not depend on ideology: it spans the whole political spectrum and is underpinned by corruption. In order to understand the nature of Russian influence in a country like Bulgaria, you have to look at the domestic factors first. Recognising how Russian interests manifest themselves in this situation means less attention should be paid to the kind of Duginesque variété theatrics. It is not Eurasianism or any kind of transnational fascist authoritarianism that poses the most serious threat, although there are certainly some political forces that embrace such ambitions. In Bulgaria, with its dearth of fact-checking media, the “post-truth” reality is one that is self-inflicted and egged on by alarmism in western media. This media distraction conveniently covers up the shady dealings of Bulgaria’s elites and the very real Russian interests at play.